Once ‘leave your brains behind’ served as a sorry excuse to tolerate inane comedies. Now it’s an unabashed selling point. It must take enormous self-control to resist a plot and create drivel of such epic proportions while also convincing some of Bollywood’s best talents to commit themselves to absolute baloney. Like his previous movies in the Dhamaal series, Director Indra Kumar follows the ‘brains not required’ model in Total Dhamaal as well. And so characters appear out of nowhere, dive into nowhere and dash towards a destination in a manner so random, it’s like watching two hours of channel surfing between vehicles and wildlife. If Dhamaal ripped-off a good chunk of Hollywood’s It’s a Mad, Mad, Mad, Mad World, Double Dhamaal got its kicks out of innuendoes. Total Dhamaal avoids the missteps of the second and goes back to Dhamaal‘s tried-and-tested It’s a Mad, Mad, Mad, Mad World formula. Except what Indra Kumar’s brand of broad comedy doesn’t realise is the fun of achieving outlandish set pieces and all the bumbling human beings and desperate wit it sets off. There is a lot of ruckus but little reveling as his roster of stars descends into outright clownery for the sake of a chuckle. Four pairs of money-seeking morons are in a crazy rush to reach a zoo hiding all the loot — a freshly divorced couple (Anil Kapoor, Madhuri Dixit Nene), a pair of blundering siblings (Javed Jaffrey, Arshad Warsi), a no-good crook and his sidekick (Riteish Deshmukh, Pitobash Tripathy) and a hunky robber and his partner-in-bromance (Ajay Devgn, Sanjay Mishra). Hot on their trail is a shady cop and his smartass underling (Boman Irani, Vijay Patkar). Cars, choppers, planes, parachute, bikes, jeeps — you name it — collide, collapse and combust atop under-construction buildings, waterfalls, wooden pole bridges, and desolate deserts — I’ve just described the first half of Total Dhamaal. If its mechanical engineering nightmare doesn’t crack you up, the zoological shenanigans of its second half certainly will. Especially if you are a four year old. But, god help, if your idea of humour isn’t elephant vomit. Total Dhamaal may be free of double-entendres, but keeps with Bollywood’s painful tradition of racist jokes and henpecked husband woes. Another downer is its excessive use of godawful computer graphics. The clumsy VFX of airborne scenes and phony animals in world’s fakest zoo induce major cringe. The silliness has its stray moments. None of which include Ajay Devgn who’s stiff as a board or even the usually reliable Sanjay Mishra, confined to blabbering Bro before every sentence. There’s Riteish and Pitobash adding to the nuisance value. Bollywood’s beloved Bhidu offering GPS services in classic Chindi-lingo is a droll touch. Javed Jaffrey’s Minions breaking Matka-print overalls score a laugh. Arshad Warsi’s snake-aided rescue in quicksand is puerile, but not without merits. Johnny Lever’s cameo reiterates his mastery over all things wacky. Anil and Madhuri doffing their hats to One Two Ka Four works on pure nostalgia. The jodi is smashing as ever and makes the banter work despite the shabby writing. In Hindi cinema’s grossly glamorized portrayals, dakus are either rifle-totting, horse-riding Robinhoods dispensing justice or brutish plunderers going after wealth and women. That they could be damaged individuals bound by a code whose skewed morality and dangerous demands are gently corroding their souls is what makes Abhishek Chaubey’s Sonchiriya one of the most fascinating takes on the subject. His stark, steely, stirring insights into Chambal’s dacoit community examines the cost of dharma and daredevilry through the prism of psychological flux. Ideology is a dangerous beast. Its inflaming presence can ignite a revolution against tyranny but eventually when disenchantment sets in, the violence will wear off, the spark will burn out and a man will seek closure over conflict. These outlaws or baaghis (rebels) as they address each other are resentful products of a failed system and dead duck promises made by people in power. When a character quips, “Sarkari goli se kaunu mare hai? Inke toh vaade se mare hain sab –behno aur bhaiyon,” it’s coming from a place of long harboured indignation. It’s a hard life. There are no horses, no mutton (not much anyway) and certainly no mobile phones. The weight of rifles and rounds of bullets is burdensome to bear. The dead snakes on land and hungry crocodiles in water carry signs of doom and danger. It’s a dreamless existence, ambling from one dusty corner of the ravines to another, escaping cops and questioning the glory in it all. Humour is their sole source of survival. The year is 1975 and former Indian Prime Minister Indira Gandhi’s declaration of Emergency reverberates across the radio even as a band of baaghis announces its unwelcome arrival at an unsuspecting wedding. The pack’s leader Man Singh (Manoj Bajpayee) — in a clever nod to his character from Shekhar Kapur’s Bandit Queen — follows a polite protocol and seems sincere in his desire for minimum causalities. Though he’s far removed from the ways of ghar-grihasti, he is respectful of rituals and customs. Chaubey and his writer Sudip Sharma throw in a quaint gesture to underscore it nicely. But Sonchiriya has no time to make nice. 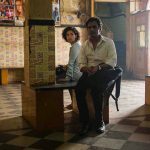 Its minefield of volatile impulses and brewing unrest comes alive in Sharma’s meticulous screenplay; Meghana Sen’s watchful editing, Benedict Taylor and Naren Chandavarkar’s Morricone-evoking background music and Anuj Rakesh Dhawan’s immersive, superlative camerawork at every step of its relentless chase between outlaws and cops. On the run, the rebels, still processing the losses they’ve incurred, come across a chance to redemption. When we first meet Indumati (Bhumi Pednekar) she’s multitasking between a girl, ghoonghat and a gun. It’s a solid introduction to her spirit AND story that unravels gradually but hits most hard. Women are treated as a liability by movies of this genre but Indumati is both a carrier of and catalyst for conscience. Entrusted with the reason why the movie is named Sonchiriya in her care, Indumati represents a strength that’ll take any number of blows to protect her beliefs and do the decent thing. The extent of sickening patriarchy she encounters forms a significant core of Sonchiriya’s socio-political commentary. Often Sonchiriya’s narrative draws parallels between the nature’s food chain and hierarchy of India’s woeful caste system. How it colours minds making them unable to judge anything outside its diktats is most conspicuous when it drives a wedge between Thakur-Gujjar colleagues. Sonchiriya is an entire mood within a movie. One that is bleak and inaccessible –and not always because the language spoken is thick Bundelkhandi –playing with English subtitles– until you see the craft in it. Sushant Singh Rajput’s understated turmoil and compassion perfectly captures the guilt and fatigue of a man fighting apparitions and seeking salvation. 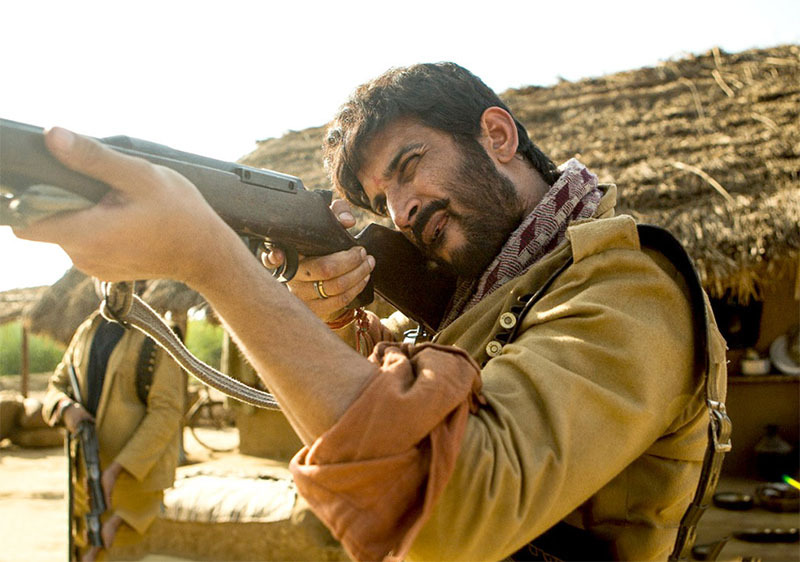 The little vulnerability he preserves amidst the grime is the heart of Sonchiriya’s meditative madness. Once again, Bhumi Pednekar proves her mettle in playing characters defined by integrity and nerve. Bajpayee’s wisdom and wit sets the tone for Sonchiriya’s allegory on moral ambiguity and atonement. Ranvir Shorey’s gruff show of obstinacy and belated realisations hits all the right notes. And Ashutosh Rana’s silently simmering rage, linked to a massacre most unfortunate, is one of his most effective performances in recent time. 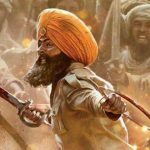 Chaubey and Sharma recreate a bygone era’s lore and legends, groom it like a Western, pace it like a thriller, infuse it with surprises and social relevance around lyrical visuals and impactful writing, even its booming dishkyaons hit harder than all the empty pooh-pahing we hear around us all the time. There is a two-second scene in Gully Boy when Ranveer Singh gets out of the car he is chauffeuring and catches his reflection in a posh building’s glass door. This is not who he wants to be. Later, he sees the same resigned look on the faces crowding the Mumbai local. Every now and then he encounters disheartening reminders of his place in the world. Things are so ridiculously hopeless that one might as well make an extra buck from it. So when a party of tourists arrives to admire the compact lifestyle of Mumbai’s largest slum district and captures its residents like museum props, some vacantly wave; others set a price of admission. It is a deceptively funny depiction of a deeply disturbing reality. The crammed Dharavi kholi he breathes in and the domestic discord it perpetrates may be unsuitable for his aspirations but fuels his poetry anyway. Like an artist finding solace in chaos, Murad finds his voice in despair. A little shy and sad of eye, as songwriter Eden Ahbez would say, the man weeps through his words: Is basti main sabki palke geeli kyon hain? But when a bouncer outside a nightclub shoos him away, he makes a gentle vow, Apna time aayega. How he finds his way in is the journey of Gully Boy, inspired by the original rapper duo Divine and Naezy. Film-maker Zoya Akhtar, top of her game more than ever, is an expert at peering into souls, relating their inner conflict and sympathetic of their torment. She does so spectacularly and stylishly in Gully Boy while also bringing Mumbai’s underground rap scene into mainstream consciousness. Teeming with socio-political heft and dark horse dynamism, the extensive soundtrack put together by an eclectic mix of wordsmiths and musicians is the heartbeat of Gully Boy. And Zoya’s script soaks its fierce energy to provide majority of the subtext. The underdog fairy-tale packs in such exhilarating sound and spirit, you’ll leave the theatre thumping to its beat. It could be about Murad’s mom (a searing Amruta Subhash) having a meltdown after her husband brings home a second wife. It could be about his obnoxious father (Vijay Raaz, at his masterful best) refusing to accept his son’s wishes. It could be about Murad’s friend (a nuanced Vijay Varma offering a Ben Affleck to Singh’s Matt Damon in their Good Will Hunting-reminiscent chemistry) and his lawless pursuits concealing a world of darkness under a playful facade. It could be about Mc Sher (Siddhant Chaturvedi, what a scene-stealer, what a rockstar! ), Murad’s mentor-like mate forgetting his drunkard dad woes in swaggering music. Mostly though it could be about Safeena (Alia Bhatt), Murad’s childhood sweetheart, a dragon in a lamb’s body prone to violent outbursts in fits of jealousy. Her hot-tempered side is in complete contrast to the sublime, silent moments of romance she enjoys in Murad’s company. He is timid. She is ‘tod phod.’ They have known each other half their lives, lug similar looking backpacks to college, share earphones and steal kisses. Nursing surgeon dreams, Safeena seeks respite from her conservative parents — a mom (Sheeba Chaddha on point) constantly nagging her to marry, a father (Ikhlaque Khan, all grace) too meek to protest. Alia Bhatt is like an irresistible imp mincing no words, pulling no punches in this nugget of a performance. Ranveer Singh’s exuberance contributes to bulk of his personality. In its absence, he is a brand new person and I dare say someone you’ll cry for, root for and rap with. Though his poor little poor boy vulnerability makes him an easy target for disapproval ranging from rude (Naukar ka beta naukar) to ribtickling (Tujhe gaana hi gaana hai toh ghazal gaa le), his power-packed renditions are as potent as his peaceful rumination. Those longing eyes and mopey-faced sadness, captured keenly in cinematographer Jay Oza’s unblinking gaze, crush the viewer to the core every time he’s forced to compromise. Similarly, the confidence he gains when fellow rappers applaud his ‘bahut hard’ creativity is all kinds of feel-good.